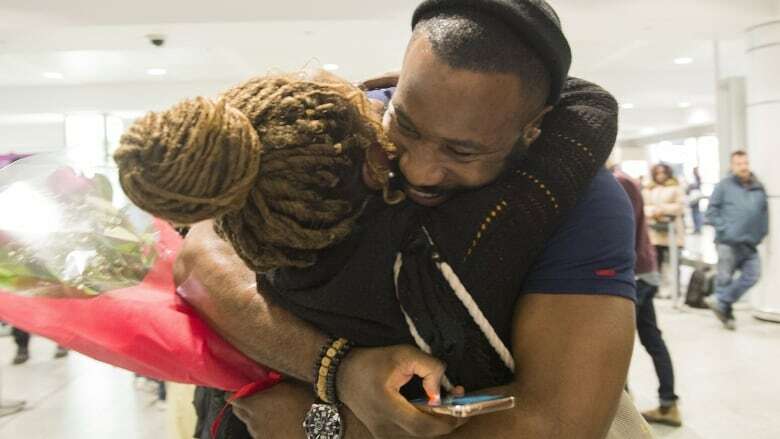 The vacationers, who had been unable to return home because of violent street protests in Haiti, were transported by helicopter to the airport in Port-au-Prince, the capital, then flown to Montreal. The 113 Quebec tourists who were stranded at resort in Haiti due to protests in and around the country's capital landed at Montreal's Pierre Elliott​ Trudeau airport on Saturday evening. 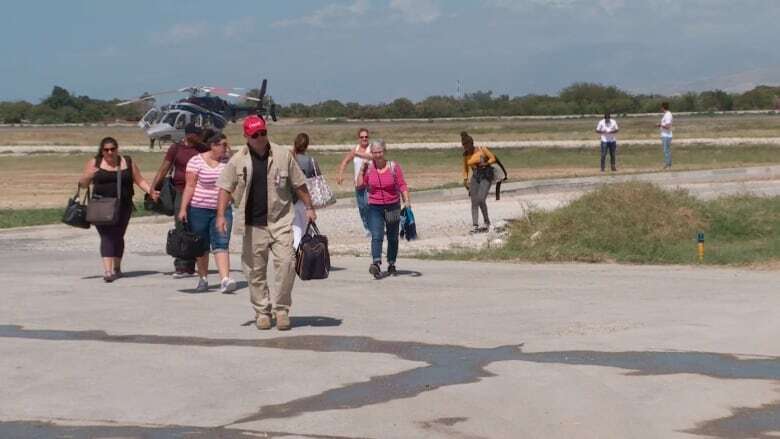 The vacationers, who were staying at the Royal Decameron resort about 80 kilometres northwest of Port-au-Prince, were transported by helicopter to the Haitian capital's international airport, then flown to Montreal. 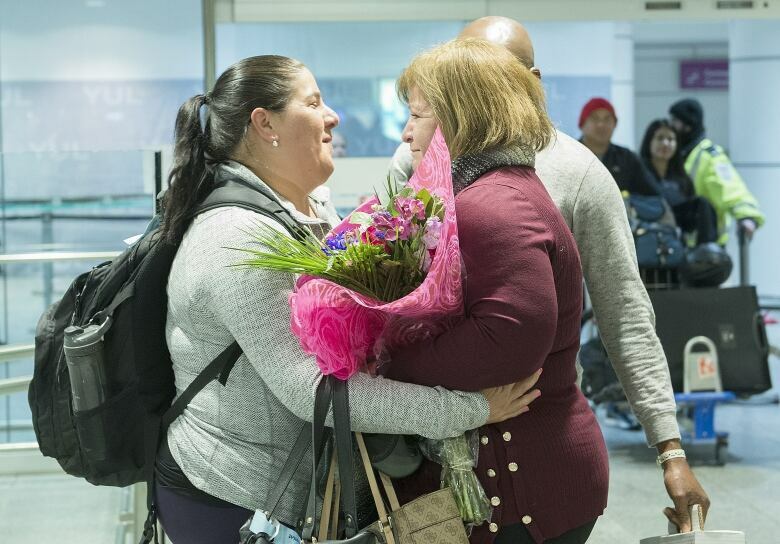 Air Transat, the company which booked the tourists' vacation packages, put out a statement Saturday afternoon saying that it would be a relief to have the affected passengers back on home soil. "Our clients and their loved ones had a difficult week," said Annick Guérard, chief operating officer for Air Transat, in a statement. Guérard was on site in Port-au-Prince along with company president Jean-François Lemay, overseeing the efforts to fly the 113 travellers home. "Since tensions came to a head in Haiti, our team has been mobilized and working hard to repatriate our clients safely and as quickly as possible," reads the statement. Starting earlier this week, Haitian protesters blocked streets and highways to rally against skyrocketing inflation and the government's failure to prosecute the alleged misuse of development funds from an oil assistance program sponsored by Venezuela. The protesters want President Jovenel Moïse to step down, which he has refused to do. At least seven people have died since the demonstrations began Feb. 8. The recent protests made the drive to the airport too dangerous, leaving dozens of Canadians — including missionaries and health-care professionals doing aid work — stranded in various towns and villages. On Friday, Prime Minister Justin Trudeau said Global Affairs Canada and the country's diplomatic corps are working to keep Canadians who are trying to return from Haiti informed. But Katherine O'Neil, a nurse from Montreal who is stranded in a different town, south of Port-au-Prince, says she has had trouble getting information from the government. She and the other Canadian nurses she's with have managed to charter a helicopter to take them to the airport on Monday. They planned to be on an Air Canada flight that leaves for Montreal around 3 p.m. The nurses have raised more than $17,000 through a GoFundMe page to cover the cost of the helicopter, and say they will donate whatever they don't use for the trip home to the charity they are volunteering with, which is called Hope Grows. The Global Affairs Canada website is advising Canadians to avoid all travel to Haiti, warning the security situation could deteriorate quickly. In a series of tweets Saturday afternoon, the government indicated the Canadian embassy in Port-au-Prince is still operational and providing consular services. Those who need emergency assistance should email sos@international.gc.ca or call 1-613-996-8885.